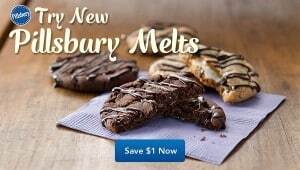 You can save money with the Savvy Shoppers Pillsbury Melts coupon. The coupon is for $1 off your next purchase of Pillsbury Melts and can be downloaded here. You will save $1 on one package of any Pillsbury Ready To Bake! Melts Cookies. The coupon automatically expires 30 days after printing. You will only be able to print this coupon until September 30th. So hurry up and grab it today.